This is the second in a series of posts about Le Grande Experiment (which translates into no language except the one we’ve made up), a recent adventure wherein we sent teams to Denver and Italy on a vital mission: to hunt down and test the best equipment for scaling up our process. Our current setup works well for our factory space on Valencia Street, but as we grow into our new factory space on Alabama Street, we believe there are better options out there for improving the quality of our chocolate and expanding our capacity to experiment. While we could do the work on the phone, we find the best results come from hitting the road and getting our hands dirty. Here, Cynthia recounts a trip to Denver with Greg to visit Steve DeVries. 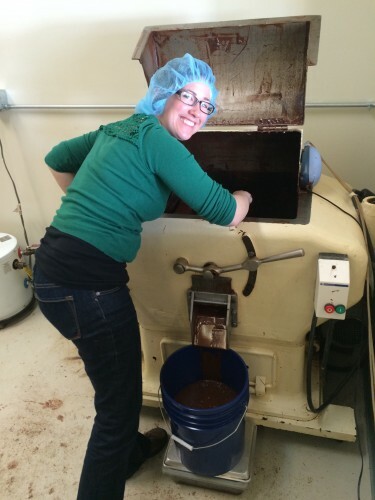 When I travel, I love stopping by other chocolate makers to see what they’re up to. Somehow, even though I grew up in Denver, I never thought to visit Steve DeVries’ chocolate factory when I visited home. 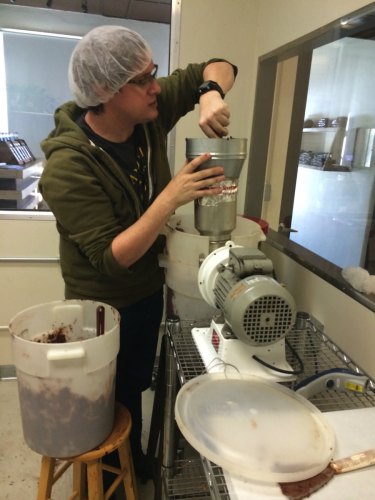 Steve is a sage researcher who I read about when I first started my chocolate studies a long time ago, so you’ll imagine how excited I was to visit him, learn about his process, and test our own chocolate on his machines while visiting my family for the holidays earlier this year. The grand goal of Le Grande Experiment is to test refining and conching equipment in order to narrow our focus on the machines we will use in the new factory. At the moment, we use melangers (those spinning silver drums) in the factory to do both jobs—reducing the particle size of the nibs while evaporating undesirable, volatile aromas. De-coupling these jobs into two machines allows us more control over optimizing for flavor and texture. At least, that’s the hope. At Steve’s factory, we got the chance to test out a bunch of different machines, including a winnower that also cracks the beans (we use a separate machine to do that). Before we went to Denver, we roasted Madagascar beans in our factory on Valencia Street, and shipped them alongside some organic cane sugar in sealed buckets to Steve’s factory. We flew to Denver, and after enjoying a lovely and snow-filled Boxing Day (yes, the Canadian government lets me claim citizenship), we joined Steve to make chocolate while the employees of Ritual Chocolate who normally use his machinery enjoyed some time off. As you can see from this snapshot of my chocolate maker skills test from when I started at Dandelion, it was once considered highly skilled to winnow a batch of chocolate (30 kgs) in under three hours. Even four and a half hours was considered decent. Now, we winnow in about a third of that time. Back then, we had to continually scoop nibs into our winnower and regulate the flow by adjusting a valve at the bottom of the hopper. It was duck-taped together, the fan at the bottom frequently got backed up with nibs, and we had to make the nibs flow uphill both ways. Well, just kidding about that last part, but there were a lot of obstacles in the way of a good, clean, fast winnow. It was a great step forward when we started using our current winnower, with a modified design built by Greg, our Chocolate Sourcerer, and Snooky, now our Magic Man of Machines. The current winnower allowed us to start a batch and walk away, and decreased our winnow time to one and a half hours per batch, most of which was time we could spend doing other things. PROS: Faster and more efficient, cracks beans, removes radical, has cool-looking conveyor belts, and is safer than our current cracker. CONS: Not much here. It’s louder than our current winnower (but not by much). Our pre-refining technique has also evolved since I started at Dandelion. 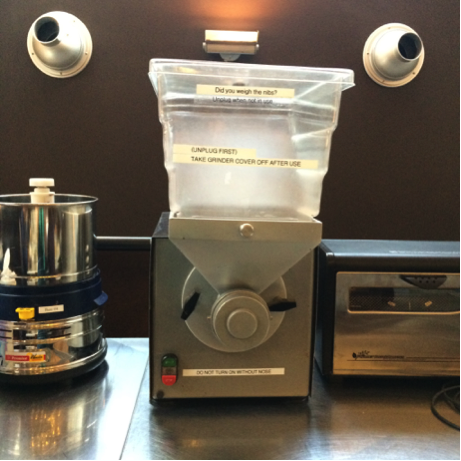 Originally, we used a standard peanut grinder to make a paste which we slowly added to our melangers. We now use a Hobart Cutter Mixer which grinds our chocolate to a soupier consistency, but also heats it up a fair amount. The chocolate paste was too thick to stir the sugar in by hand, so we took a break to run to the hardware store to buy a mud mixer attachment for the drill. 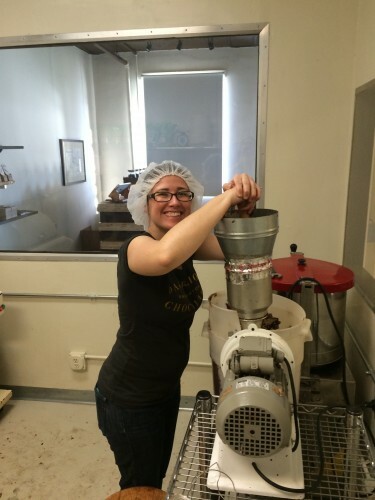 As you can see, the equipment we use for making chocolate is very rarely meant for making chocolate. We’re not considering buying the Victoria Molino, but it did give us consistent particle size, as well as lots of time to pick Steve’s brain. At the early stages of refining, the nib and sugar particles are still large and rough. After a day or three in a melanger, the chocolate is smooth. The refining process at Dandelion has been pretty much the same the entire time I’ve been here. We use melangers with big granite wheels and bases to crush the nibs and sugar together. 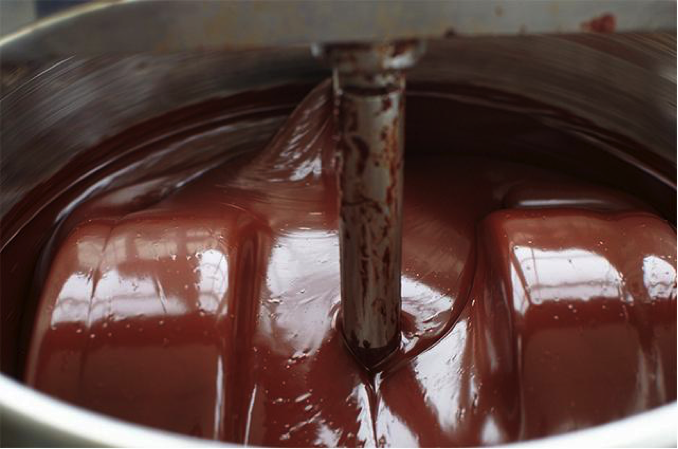 The process also conches the chocolate, allowing aromatics to evaporate off. We’ve tweaked the process a bit over the years and upgraded in size, but still use the same type of refiners that we started with. We started using our first large Cocoatown, which we later affectionately called “Granny,” about two years ago, but she slowly ground herself to death over two years of continuous usage (disproving the theory that hard work never hurt anyone). The melangers do a good job of refining, but we’ve learned that there are areas where we’d like to have more control. 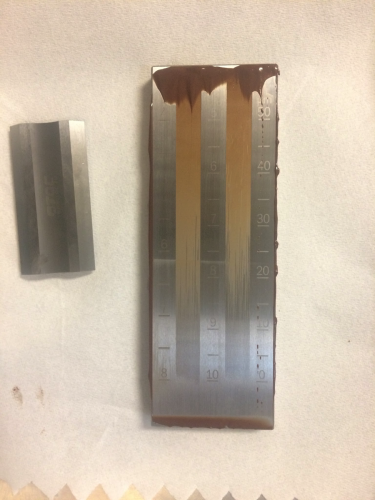 At Dandelion, we test the chocolate to determine the largest particle size in a sample using a micrometer (another technology we are in the midst of upgrading). 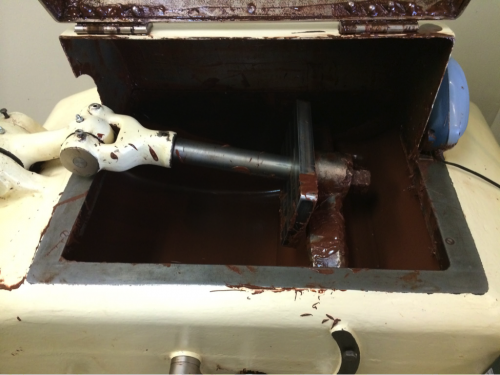 Once the chocolate has gotten to a particle size of 20-29 microns, we pour the chocolate out of the melanger, cool it, and and store it. This process has generally worked for us, but after doing some more thorough tests we learned that our micron size in one batch covers too wide a range. Steve thinks our chocolate is so viscous because of the sub 1-micron particles. Chocolate is a type of colloid known as a “sol,” and as such has cocoa solids suspended in cocoa butter (which, at this heat, is in its liquid form). The more we break apart large particles to refine them, the higher the total number of solid particles are suspended in the cocoa butter. If there are too many particles to suspend, they don’t have enough cocoa butter to surround them and end up gumming up the chocolate. At Steve’s we used a three roll refiner. I was most excited about trying out the roll refiner because I’d heard about other chocolate makers switching over to the roll refiner side. I’d heard that they took forever to use and that some chocolate makers spent twelve hours of active time on one batch just in roll refining! (In contrast, our chocolate spends about three to four days on our melangers, but it’s mostly inactive time for us since we don’t have to be standing next to the machine to ensure that it’s running correctly). 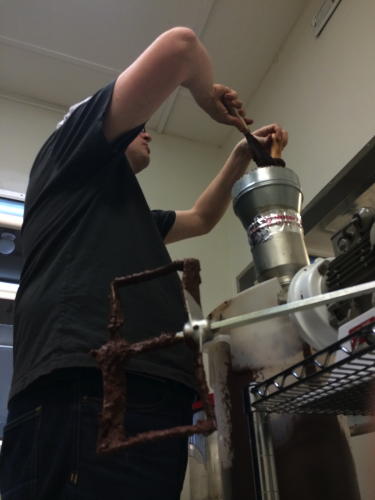 Since our chocolate was still thicker and more viscous than the chocolate that Steve normally passed through his machines, he had to do a lot of adjustments to make the machine function properly. 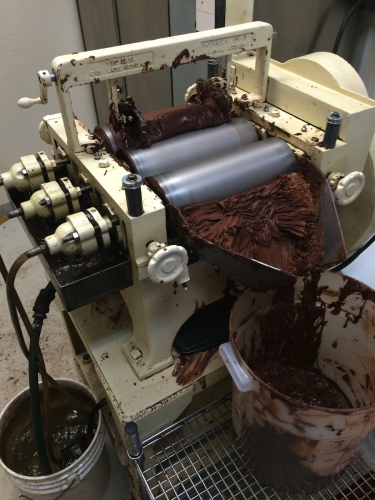 We kept the pre-refined chocolate and sugar mixture in a heated cabinet to keep the cocoa butter melted so it would pass through the machine better, but adjustments were needed to help it work. 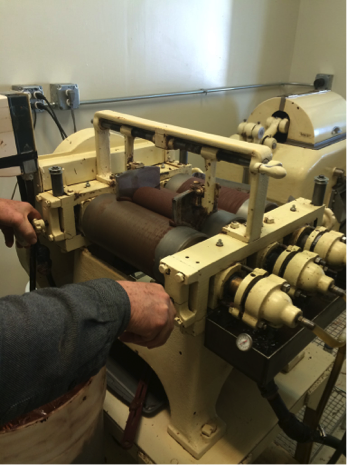 We kept the middle roller in place and adjusted the rollers on either side either closer or further away, depending on how the chocolate was flowing. Meanwhile, a steady stream of water runs through the rollers to keep them from overheating due to the energy created from reducing particle sizes. As the rollers are used more, they heat up and expand and need to be adjusted. PROS: Mostly uniform particle size (varies because machine is adjusted by hand), eliminates both the large and small particle sizes that our current melangers create, and it’s a fun machine to operate and watch. CONS: Takes a long time (possibly because the machine is small), requires active time, requires a lot of adjustments which means it needs a skilled operator. It’s a bit messier than our current machine. 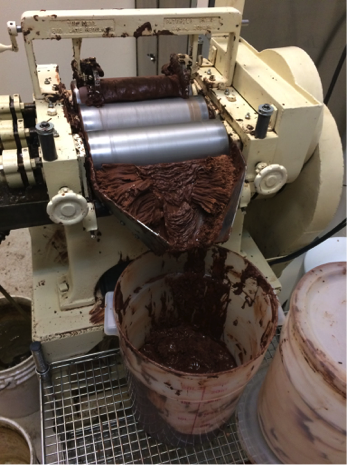 Conching is the process of mixing the particles evenly throughout the mixture and aerating the chocolate so that volatile aromas evaporate off. The process has also stayed relatively the same since I’ve been at Dandelion. The only major changes we’ve made that I can remember are standardizing the time at which we add sugar to the nibs, and changing the speed at which our melangers turn based on each origin. And once, a long time ago, we held a heat gun to the machine with velcro to help heat off a very astringent and bitter flavor in a Colombian bar. Now we spend more time finding better beans, so we don’t need to do this. 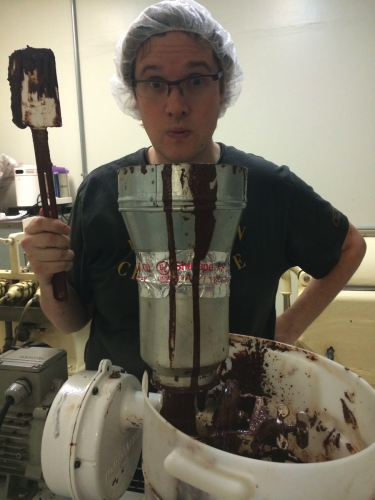 At Steve’s, we were excited to try his Chef D’Ouevre, a longitudinal conche that held 80 lbs of chocolate. 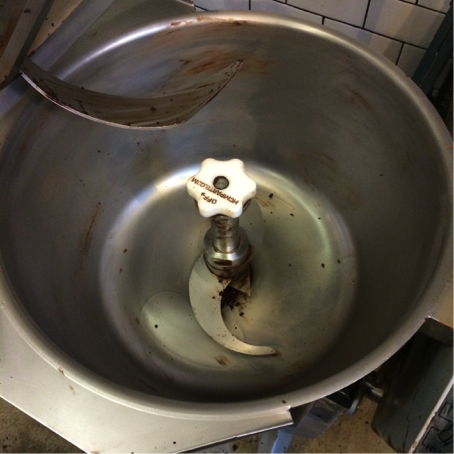 It was simple to use; we just poured the buckets of refined chocolate into the longitudinal conche and turned it on. At first, we ran it with the top lid open (to help the volatile aromas which evaporate off dissipate), then we closed the lid and let it do its thing for about four days. 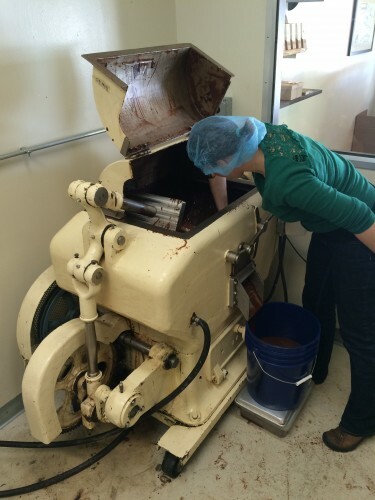 The conche works by moving a roller over the chocolate. The movement creates a “wave” of chocolate because the sides of the conche are rounded which invites air to be mixed into the chocolate. The bottom of the conche is granite and the chocolate is squished between this and a roller which rounds out the particle shapes that start somewhat jagged from the refining process. 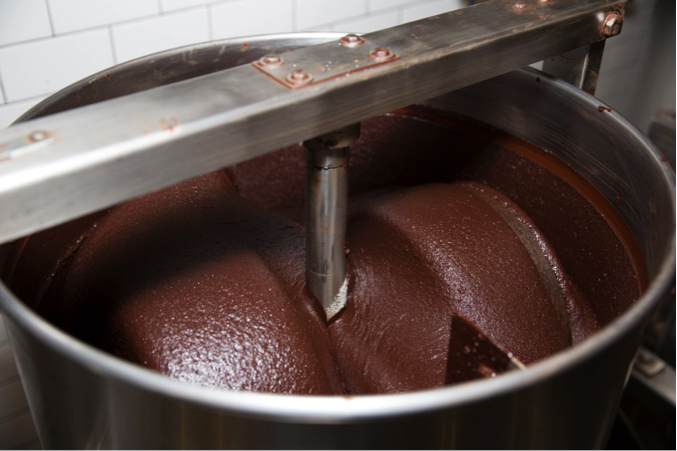 This whole process creates a smooth chocolate that has a velvety mouthfeel. PROS: Creates a velvety textured chocolate, easy to clean, can start it and walk away, very cool to watch working, and can be stopped at any point when flavor is best. CONS: Loud, requires a lot of energy, hard to find since they’re a lost art(? ), particles are rounded out on the machine, we could find ourselves loving the taste but keeping the chocolate on to improve texture. First off, Ritual Chocolate and Steve DeVries were wonderful hosts and I enjoyed spending a few days out of my holidays with them. 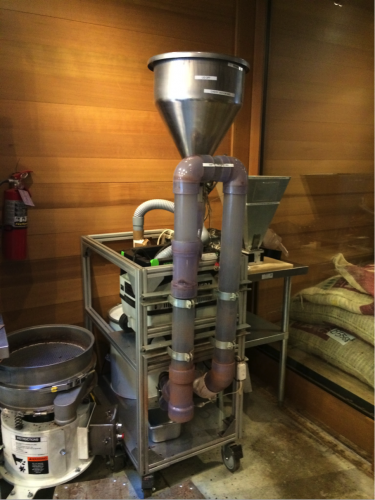 I loved the experience of making chocolate this way and left hoping that we would get a few similar machines. We will have a post soon with the scientific results of our experiment, but from a technical standpoint, I like that the roll refiner can theoretically decrease our particle size distribution, which means the difference between the largest and smallest particles in a single batch won’t be so big. I’m also enthusiastic about the fact that we might reduce viscosity because the chocolate was sloshing around in the conche and I could never imagine using the word “slosh” with our current melanger which makes chocolate that would be described as “glop”. The only piece of equipment we used that I would not want to continue using in the same manner is the pre-refiner. 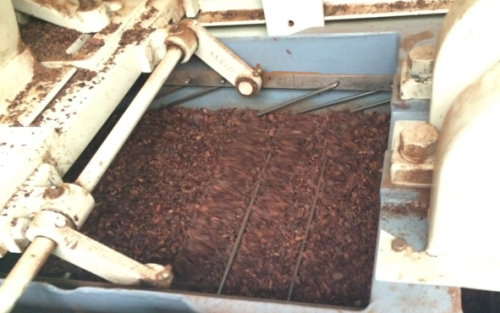 We really had to fight to get our cacao through the machine, in part because our we used a lightly roasted bean, but I think I’d want something that was easier to use. A special thanks to Steve and the folks from Ritual for helping us in our mission to upgrade our process! You’re the best.